After some impressive ensembles and many Bollywood starlets on display, the Lakme Fashion Week finally concluded on a colourful note. Many have expressed their displeasure about the heavy Bollywood presence at the event. Some were of the opinion that the focus shifts to the celebrities rather than the designers and their designs. However, it wasn’t all about Bollywood. 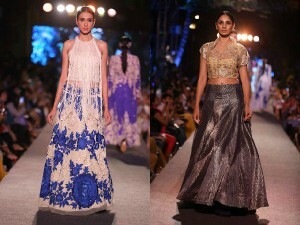 Some brilliant creations were at display at the LFW ‘15. India has always been obsessed with colours and the LFW ‘15 was no different. Combining western wear with pretty tones like Ivory, Glacier Grey, Classic Blue and Strawberry Pink was in trend this season. These combinations came as a burst of cool fresh air in the scorching summer heat. While western wear provides the classiness, the burst of colours add a touch of playfulness to one’s overall persona. 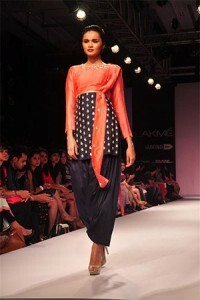 Apparels such as, High-Waist Shorts, Wide Legged Culottes & Racer Back Tops were heavily relied on to make a statement. Here are a few key take-aways from the LFW ‘15. Watch your tone: Your staple black or white is a trend we are discarding completely. Flashy colors are a cool way to freshen your look up. Throw in some soothing colors with black and grey to enhance your overall look. Know your Cuts: Understand your body first and then head for a cut that compliments it. The right cuts at the right places play an important role in enhancing your overall look. The dress does not need to be body hugging or round neck. Even a long flowy dress can do the trick. Go Tropical: This summer, tropical prints are bringing the breezy and beachy vibe. These prints can be best paired with Sheer fabrics as seen in Gauri Khan’s show. Tropical prints look great not only in western outfits but are extremely graceful in ethnic Sarees and Lehengas too. Make Up Trends: Dewy faces, graphic eyes, glossy hair and sculpted lips were the major beauty trends spotted on the runaways. Sleek hair paired with bold eye make-up is the way to go this season.